On Christmas day we had two services, the morning service and an evening service to close the convention. 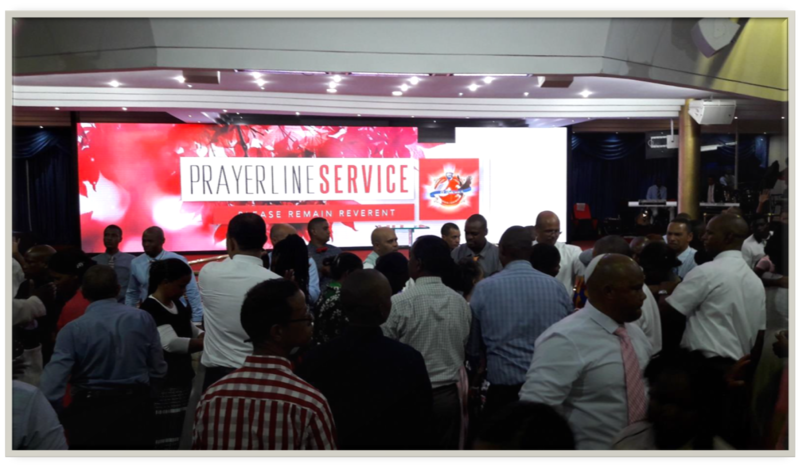 The morning service was dedicated to the different ministers from all over South Africa and Swaziland to greet the people. Ministers from Cape Town, Grabouw and Vredendal, to the Northern Cape town of Upington, through the Karoo to Richmond, Aberdeen and De Aar; to the Eastern Cape city of Mthatha; northwards on the east coast to Port Shepstone and Durban; inland to the far north Polokwane and Venda, came to the pulpit to exhort the convention attendees. After the pre-service the pastor of the church, Pastor Jonathan Roscoe came to the pulpit. He made a few comments before he called the ministers one by one to the platform to greet the people. As the minister came and spoke, the impact of EL Tabernacle-EHR Ministries across the country became crystal clear. There are ministers running with the EL Tabernacle banner and the anointing in EL Tabernacle country wide. After the ministers greeted, Pastor Jonathan stepped forward. 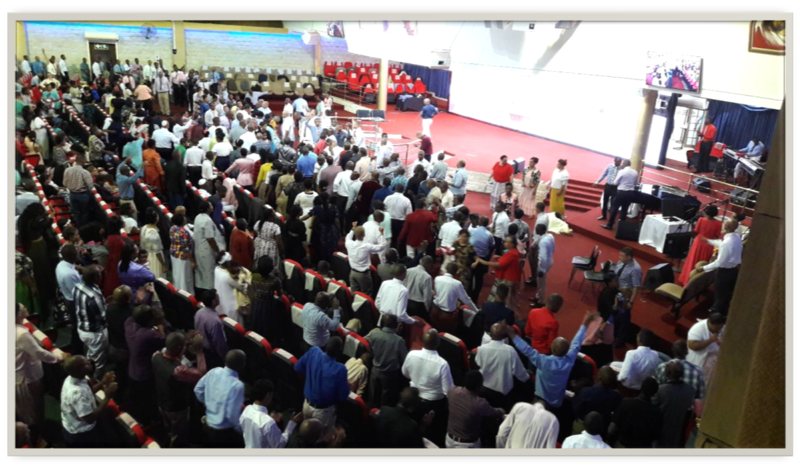 During the 2016 Convention an impromptu prayer line formed as the people came to Pastor Jonathan for prayer. This year it was a different scenario. He changed the atmosphere as he called the prayer line reminiscent of Bro. Branham’s Tent Vision when a young man called the prayer line. In EL Tabernacle you are always learning more and more about God and how He operates. The different ministers were exhorting as they were greeting. People were worshiping, victory in the camp. 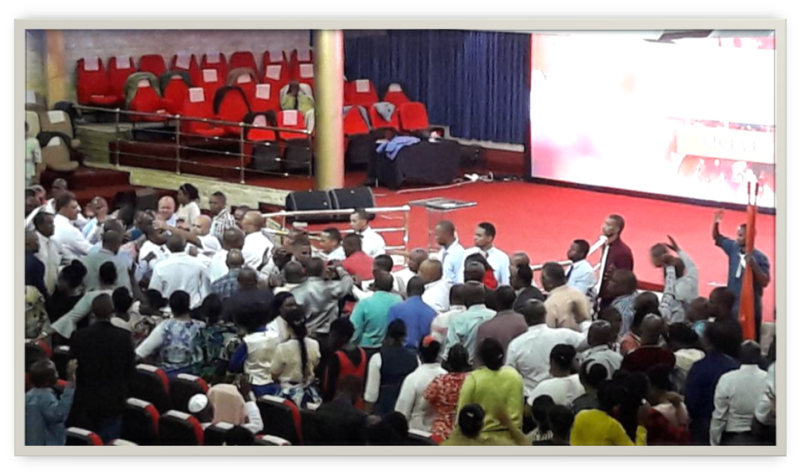 When Pastor Jonathan stepped forward at the end, he did what can be regarded as one of the most difficult things to do: he switched the anointing, the atmosphere changed to a healing, deliverance overcoming anointing. He changed the anointing to a soft, deep prayer line anointing. The screaming and shouting did not stop. No! 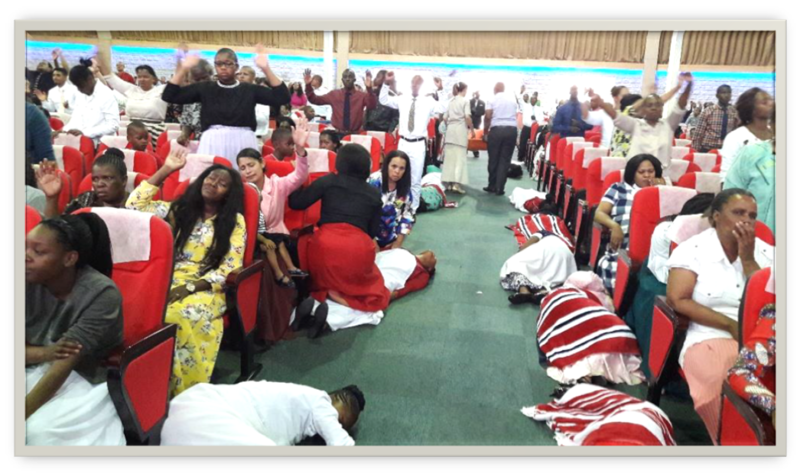 It continued but under a different anointing as it was turned into shouts of healing and deliverance as the people moved through the prayer line and the Angel touched them, healed them, delivered them. There is always a noise in EL Tabernacle. God is Life. Life is motion. Motion brings emotion. Emotion brings a noise. Hallelujah!!!!! There is always a noise where Jesus is. Below: The passages being utilized as the need for space increased. 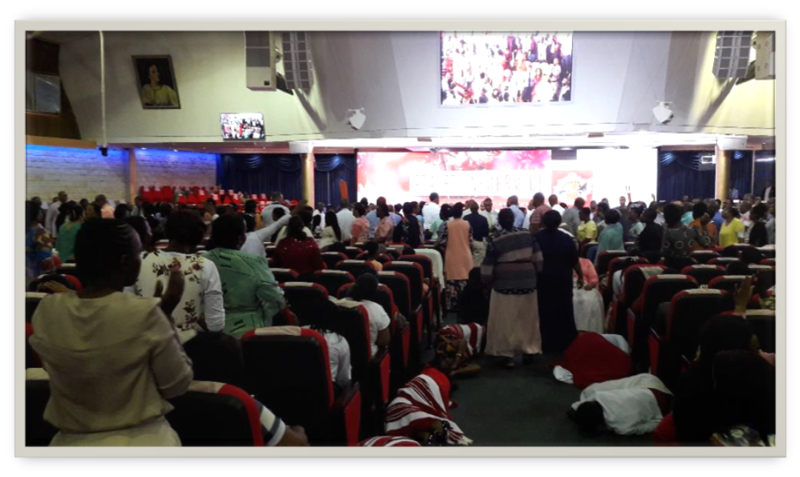 Sisters, on the floor in the passages, after being slain under the power of the Holy Ghost as they went through the prayer line. The most amazing thing I observed deals with the anointing during the prayer line. The chorus leader was singing along, the musicians playing, as it kept the anointing just at the right “temperature”. There was no building to different peaks, no. The anointing was constant throughout. It was as if, and maybe it did, the Pillar of Fire was hanging over the prayer line. In my spiritual eye, I could almost see the Angel standing there with His arms folded, watching over the proceedings. I timed the prayer line. It lasted for about three hours and ten minutes. Just think about it. The prayer line continued for just over three hours. 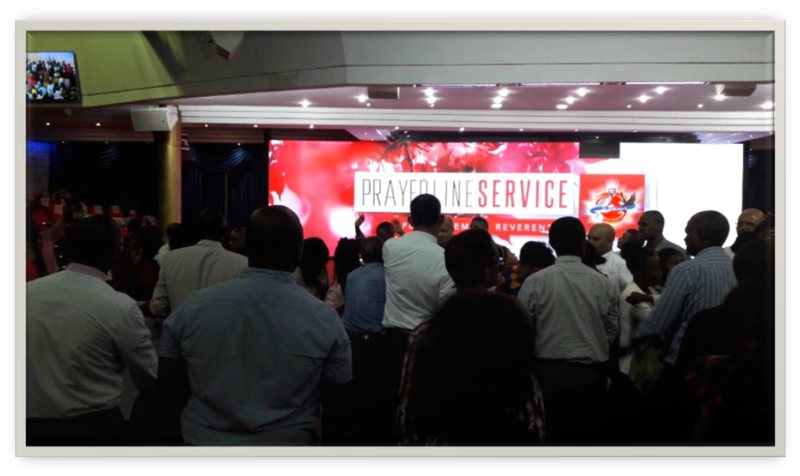 For the duration of the prayer line the presence of God was there. The prophet speaks about being in the presence for five minutes and you can never be the same again. We were in the Angel’s presence for a solid three hours. Another amazing thing I observed refers to the Ministers and Elders. They were doing duty in the prayer line for three hours. We dismissed by 16:30 and were back in church by 18:00. After such a heavy anointing everyone was back on his post of duty looking fresh. Think about it. It seems as if no virtue left these brothers. It reminds me of quotes I’ve read in the Spoken Word. Bro. Branham explains in, “What is a Vision”, “An Exodus” and “Gifts” and there might be more. He juxtaposes Jesus raising Lazarus from the dead and it being a far greater miracle with Jesus and the woman with the blood issue that touched Him. When the woman touched Him he became weak, virtue left Him. With Lazarus, God used the Gift. To me this is more evidence that the Angel stood in the prayer line. Right: This picture was taken towards the end of the prayer line. The people came from all over South Africa to hear and to receive from God. God was in the worship, God was in the ministering of the Word, God was in the pulpit, God was in the pews; and oh yes, yes, yes, God was present in the prayer line on Christmas Day! On Christmas evening the pastor from Mthatha, Pastor Velile Jiba preached the closing service. As he climaxed his message, the people burst out in worship. There is really no other way to describe the worship that reverberated in the tabernacle. More and more people were pulled into this rolling boisterous worship. It continued at this high intense level. The strange aspect of it, is the fact that it was the closing of the convention. That same worship that prevailed during Saturday evening’s message when the Apostle preached, continued, but this time in overdrive. The intensity and passion did not abate. 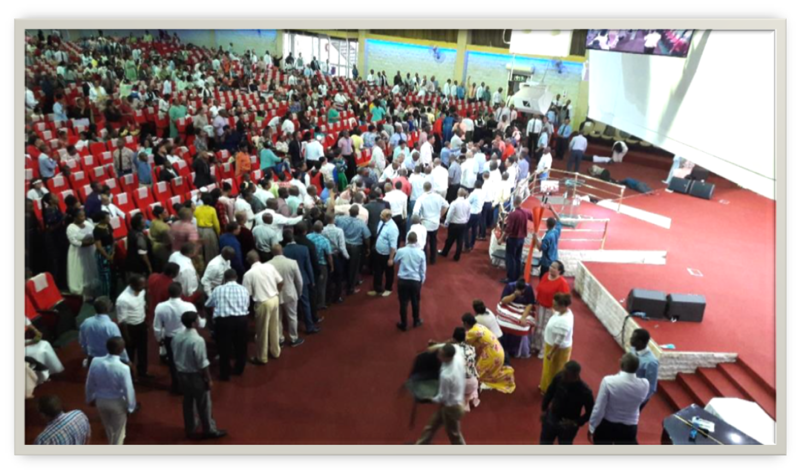 The convention started on a high note, the people under expectation ready to receive from God; it ended in similar fashion. Grateful for what God done over the Christmas weekend. The worship in EL Tabernacle has been taken to another level. Exciting worship times awaits us, it beckons us in 2018. "We were in the Angel’s presence for a solid three hours."